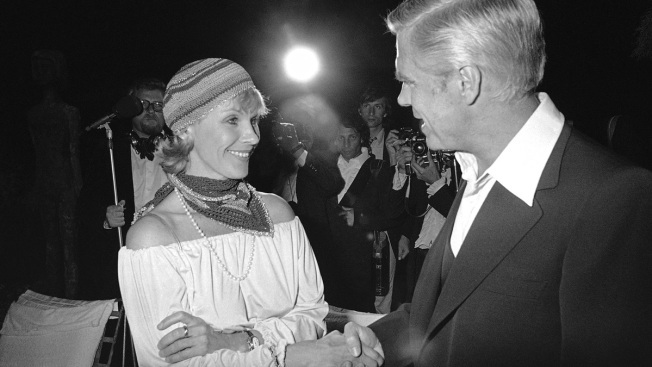 In this May 25, 1978 file photo, Swedish actress Bibi Andersson meets George Peppard at a party for the announcement of U.S. film "Cabo Blanco." Sweden’s Film Institute says Bibi Andersson, the Swedish actress who played in films by fellow countryman filmmaker Ingmar Bergman, died on Sunday April 14, 2019. She was 83. Sweden's Film Institute says Bibi Andersson, the Swedish actress who starred in classic films by her compatriot, the filmmaker Ingmar Bergman, has died. She was 83. Spokesman Martin Frostberg says Andersson, who starred in "The Seventh Seal" and "Persona," died on Sunday. The state-funded institute said Monday Andersson was four times named best actress its annual awards, and also received a similar accolade from the Berlin Film Festival, in 1963. Born Nov. 11, 1935, as Berit Elisabet Andersson, she later appeared in dozens of movies, including by directors John Huston and Robert Altman, before directing plays in Stockholm. In 2009, she suffered a stroke and disappeared from the limelight.